October 31, 2017 October 31, 2017 ~ Troy T.
As I write this Arrow season six is three episodes old. Season five was a surprisingly effective return to form. Season Four was by far the weakest season of the show. Can season six build on the strengths of season five? Here are a few of my thoughts and initial impressions. Beware, there are spoilers. I miss the gritty street level feel of the early seasons. The overall look of season six, so far, is brighter and more colorful. The overall feel is much more lighthearted. I know that the show will probably never return to the tone of the first two seasons. Hopefully the lighter tone of the first few episodes is just the calm before the storm. Stephen Amell, the rock of the show, continues to impress as Oliver Queen/Green Arrow. 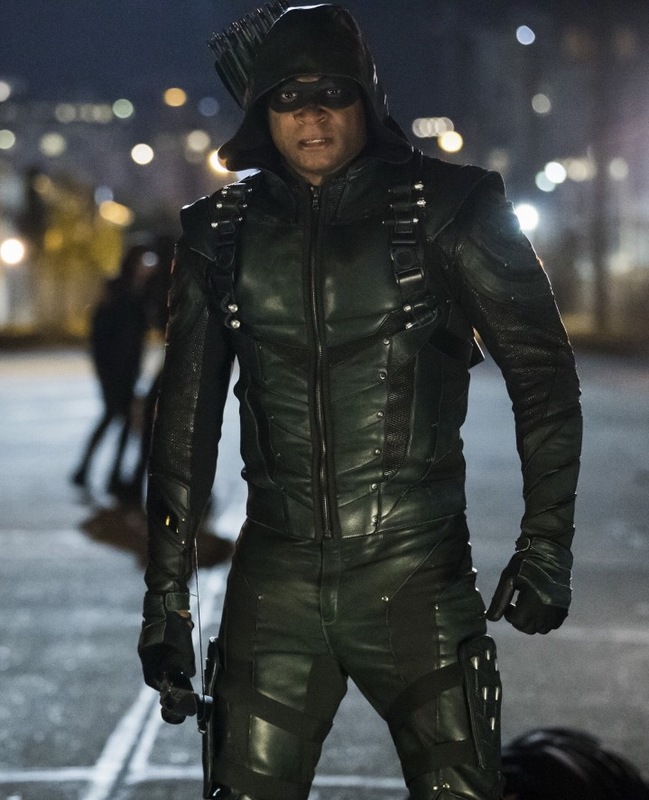 The current storyline is showcasing Diggle as Green Arrow. For now Oliver Queen is just the mayor and a father. That said, Amell’s strong presence on the show makes this must see television for me. The storyline with William, Oliver’s son, brings something very different to the show. I am not sure how it will play out in the long term. For now it is good to see the quiet, gentle side of Oliver Queen. I am glad that Wild Dog was given a costume upgrade this season. His initial costume always looked a bit sloppy to me. One thing still remains unclear. Is he shooting real bullets from his guns? I am a bit surprised that Oliver continues to lie about his true identity. I thought at some point he would reveal that he is the Green Arrow to the public. Perhaps in the future. I have come to accept Curtis Holt/Mr Terrific as part of Team Arrow. However, if he left the show I would not miss him. Two characters that I miss greatly are Ragman and Arsenal. It would be fantastic to see them in future episodes. The third episode did not feature a flashback storyline. I would say that it is time to focus on the present. The flashbacks served their purpose in the prior seasons. There are quite a few characters in the present storylines, focusing there gives each one enough screen time. I am so excited that the show’s creative team found a spot for actress Katie Cassidy. She has been so good on the show that it would be criminal not to have her on. Her portrayal of Laurel Lance was a vital part of the show’s early success. Her transition into Black Canary was flawless. When the show opted to kill off her character it was a complete surprise to me. She is excellent in her new role as the villainess Black Siren. Three episodes in and I am excited to see what this new season will bring. So far the show has introduced some intriguing storylines. At the start of season six Arrow remains one of my favorite television shows.